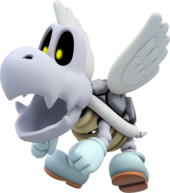 Dry Bones are skeletal versions of Koopa Troopas mainly found in towers and castles. These undead Koopas often collapse when attacked, but they soon revive themselves and become normal once again (however there are some methods to permanently defeat them). Dry Bones first appeared in Super Mario Bros. 3, in which sprites of them are edited Koopa Troopa sprites. They have since become a staple in Mario spin-off games. Dry Bones is ordinarily a lightweight character in games and is often accompanied by Boo. The Dry Bones emblem in spin-offs is a side-view of one's head. Other skeletal Koopas exist in the Mario franchise, such as Bony Beetle and Dry Bowser, but these do not seem to be Dry Bones, as they are not Koopa Troopas. Dry Bones' debut is in the game Super Mario Bros. 3. Dry Bones can be stomped on the head and turned into a pile of bones; however, they soon regenerate. Unlike normal Koopas, Dry Bones is immune to the tail of Raccoon Mario and the fireballs of Fire Mario but can be defeated with a Star or, if the player has access to one, a Hammer Suit. Dry Bones appear most prominently in the multiple Fortresses of the game, where they often accompany Boos and Thwomps. The first level that they appear in is World 1-Fortress. It is also the only appearance of Dry Bones on the Nintendo Entertainment System. In the remake Super Mario Advance 4: Super Mario Bros. 3, Dry Bones can be defeated by the Cape Feather. This item, originally from Super Mario World, can only be obtained by scanning the "Cape" card with the e-Reader. Dry Bones reappear in Dinosaur Land in Super Mario World. They are found only in Fortresses and Castles. Dry Bones retain their ability to rebuild themselves when stomped from Super Mario Bros. 3. This time, however, they can be permanently defeated with the cape or with the star power-up. They also turn around at ledges, similar to Red Koopa Troopas, instead of just falling, a trait that Dry Bones retain in the later New Super Mario Bros. games. Some of the Dry Bones in this game can throw bones at Mario, which is also an occasional trait in later games. The Dry Bones of Dinosaur Land appear somewhat different from the Super Mario Bros. 3 versions of them—most notably, they walk on two feet for the first time, they have pink shoes (red in the artwork) in place of the light blue shoes seen in later games, and are larger relative to Mario. They also appear larger than regular Koopa Troopas, despite being skeletal versions of them. Dry Bones are common in the various Towers and Castles of New Super Mario Bros.. Much like previous platformers, when Dry Bones are jumped on, they crumble; in New Super Mario Bros., their head detaches and bounces away. Once they collapse, the Dry Bones soon revitalize themselves by reattaching their heads. If the head falls into a pit or lava, it takes longer for it to reanimate itself. Finally, as in the previous platformers, they are immune to fireballs. A new variant, Super Dry Bones, is also introduced. Similarly to their smaller cousins, they can be found only in various castles and fortresses. It takes a Ground Pound to crumble them, and they revive themselves as quickly as a normal Dry Bones. Both types of Dry Bones can be permanently defeated by a Mega Mushroom, a Starman, or a Blue Shell. Super Dry Bones cannot be hurt at all by Mini Mario. Also, Dry Bowser, a Dry Bones version of Bowser, makes his debut in this game. Dry Bones make their 3D platformer debut appearance in Super Mario Galaxy, only in the Dusty Dune Galaxy, Bowser's Dark Matter Plant and the final level, Bowser's Galaxy Reactor. Unlike normal Koopas, they are bipedal, but appear as a quadruped. If they are jumped on, spun or attacked with a Green Shell, they crumble, but revive after a few seconds, just as they did in previous games. They chase Mario or Luigi once they have seen them. When a Dry Bones successfully attacks Mario or Luigi, it cackles similarly to a Boo. The only way to destroy these Dry Bones is by touching them while using a Rainbow Star, destroying them with a Bullet Bill, or luring them into quicksand. Unlike in their previous appearances, Dry Bones can fall off the ledge. When a Dry Bones is defeated, their soul flies out and back into its body; thus reviving it. Dry Bones reappear in New Super Mario Bros. Wii. They are commonly found in tower and castle levels. They act the same way they did in the game's predecessor. However, there are new means of defeating a Dry Bones; players need to use a Star, a POW Block, a Koopa Shell, or the Ice Flower/Penguin Suit to defeat a Dry Bones. In the original New Super Mario Bros., once they reattach their heads and fully regenerate, the player can jump on it to make it collapse again. However, in the Wii version, the player can make the Dry Bones collapse again while it tries to stand up. Dry Bones reappear in the game's sequel, Super Mario Galaxy 2 again, on two legs in a hunched position. They feature the same aggressive behavior and resistance to most attacks that was featured in the original. They appear in Bowser Jr.'s Fiery Flotilla, Bowser's Lava Lair, Bowser's Gravity Gauntlet, Bowser Jr.'s Boom Bunker, Bowser's Galaxy Generator and the Slipsand Galaxy. Despite it being immune to almost everything, it is possible to "kill" a Dry Bones in this game. If Mario or Luigi knock a Dry Bones into lava (by bumping into them), the Dry Bones plays an animation for sinking in the lava and subsequently dies. This is the only enemy in the game that does not blow up in a cloud of smoke after hitting lava. Dry Bones appear in Super Mario 3D Land. They act the same way as they do in the Super Mario Galaxy games, though their eyes now flash red for a second when they regenerate. They appear alongside many Draglets and Thwomps in most of the castle stages. A fireball in this game will make its head “jump” a short height, while a projectile from Boomerang Mario can make it crumble the same way a stomp does. Dry Bones and Big Dry Bones appear once more in New Super Mario Bros. 2. Like its predecessors, they are found in towers and castle levels. However, they are also found in non-boss levels, such as World 6-A. They retain their appearance from New Super Mario Bros. Wii, and can be defeated with a Star or Gold Flower. In this game, when there is a "bah" in the music, Dry Bones dance in a way similar to a Koopa Troopa. Dry Bones reappears in New Super Mario Bros. U, behaving in the same way as in previous games. However, unlike in New Super Mario Bros. Wii, they are unaffected by lava in this game. Also, once the Dry Bones reconstructs, the eyes flash a red glare, similar to their appearance in Super Mario 3D Land. Big Dry Bones also reappear in this game, as well as the Bony Beetle of Super Mario World. While the original Dry Bones species do not appear in Super Mario 3D World, a new winged variety of it called Parabones is introduced. They act similarly to the Dry Bones from Super Mario Galaxy: they attack players as soon as they see them. They break apart when they get hit, and they resurrect unless a player attacks them over lava or hits them with a Super Star. Their wings also reappear, unlike Paratroopas, whose wings fall off permanently. Dry Bones reappear in Super Mario Maker and Super Mario Maker for Nintendo 3DS. Big Dry Bones, Parabones, and Fish Bones (which can be made when the player places a Dry Bones in the underwater course theme) also appear. While they operate in the same manner in all the game styles, in the Super Mario World game style, they'll occasionally throw bones at Mario. The Super Mario World ones have also been redrawn in a smaller size due to a size discrepancy the original graphics had next to ordinary Koopa Troopas. Dry Bones make an appearance in Super Mario Run, behaving the same way as in the New Super Mario Bros. games. They are rare enemies, only appearing in three levels, Bowser's Castle Hangout, Cutting Edge Spire, and Rings of Fire! Like in Super Mario 3D World, Super Mario Odyssey does not feature Dry Bones, and they are once again replaced with Parabones. A Dry Bones in "Do the Koopa"
Dry Bones make a few appearances in The Adventures of Super Mario Bros. 3. A destroyed Dry Bones makes a minor appearance in "Mind Your Mummy Mommy, Mario", inside Queen Mushroomkhamen's pyramid. In "Never Koop a Koopa", when Princess Toadstool opens the door of Koopa Kastle, a Dry Bones falls from the ceiling, scaring her. They have a role in the episode "Do the Koopa", in which one named Bonesy tells King Koopa that upon spotting them, Mario, Luigi, Toad and Princess Toadstool have snuck into Dark Land and are attempting to find the Doom Dancer Music Box. Later on, Mario's group encounters more Dry Bones that they crush with the debris of broken Brick Blocks. They are later uncovered and freed by Cheatsy Koopa, Bully Koopa, and Big Mouth Koopa. In "Recycled Koopa", Dry Bones are one of the species who "invaded" New York City with the trash of the Koopas. Dry Bones also appear in the Super Mario World animated series, in the episode "Send in the Clown" and "The Night Before Cave Christmas". Here, both of them make a very small appearance as they try to keep Mario and Yoshi from infiltrating Bowser's Castle or stop Mario from getting a feather. The Dry Bones grabs a bone from out of its throat and throws it at Mario. A single Dry Bones appears in the Nintendo Comics System in the story It's Always Fair Weather as the pilot of Bowser's personal helicopter. When Bowser expresses outrage after discovering his image is being used for a carnival dunking booth, the Dry Bones cheerfully responds to his complaint of "I am really insulted!" with "Gee, I'd be flattered!" The two try to ruin the fair with miniature tornadoes created by the helicopter, but are stopped by Mario, who uses the copter against Bowser, launching him into the dunking booth with it. If Mario decides to follow the main road in the Koopahari Desert in Double Trouble, he stomps some Dry Bones on his way to Fort Koopa. In Koopa Capers, Luigi can find a pit filled with Dry Bones in Bowser's Fortress, and fight several of them if he decides to try and reach a door at the bottom of the hole; the powdered toes of a Dry Bones are also one of the ingredients needed by Wendy O. Koopa for a magic potion she is brewing. In Flown the Koopa, if Mario thwarts Magikoopa's attempt to freeze him and his brother, Magikoopa then throws out some bones and uses his magic to animate them as two Dry Bones. Depending on how the accompanying puzzle is solved by the reader, the Mario Bros. either trick the Dry Bones into charging into a broom closet and lock the door behind them, or they try to smash the skeletons with their plungers, only to have this backfire on them when the Dry Bones regenerate, combine, and knock them both out. Dry Bones (known as Skeleton Koopas) appear as enemies in the Philips CD-i game Hotel Mario, when Bowser and the Koopalings once again kidnap Princess Toadstool. Skeleton Koopas appear in the level Ludwig's Thump Castle Hotel. As usual, the Skeleton Koopas in this game revive themselves once they are knocked out. They, however, can be defeated with by Fire Mario, which is impossible in games before this one. This weakness to fire reappears in the Paper Mario series. In Super Mario RPG: Legend of the Seven Stars, Dry Bones appear as enemies in the Sunken Ship. They guard the ship's midsection. The skeletal Koopas have an infinite amount of HP, meaning that regular Attacks never defeat them. The only way to defeat them is with a special attack, which defeats them instantly. When defeated, they simply crumble on the overworld map. However, they always resurrect after a short amount of time and attempt to re-engage battle with Mario. A stronger sub-species of Dry Bones known as Vomer makes an appearance in Barrel Volcano. Later, a specific one, named Bones, appears as part of one of Dr. Topper's puzzles, where he had apparently competed in a triathlon. Dry Bones reappear in Paper Mario in Bowser's Castle when Bowser captures Princess Peach and her castle. Dry Bones only appear in Bowser's Castle in the game, protecting the upper regions of the castle from Mario and his partners. They are a relatively powerful enemy, as they appear about halfway through the Castle. This variation of Dry Bones is able to walk upright and throw bones at Mario. They are also capable of building more of themselves, with the same amount of HP as the original unit. They regenerate themselves if all their HP is taken, but can be permanently defeated with flames or explosions, which they are immune to in most other games. In this game, fire and explosions are extremely effective against Dry Bones. Player can use Kooper's Fire Shell or Bombette's explosions to defeat them easily. If a Dry Bones spots Mario outside battle they try to throw a bone at him to make the First Strike. This is also the first and only appearance of the Dry Bones on the Nintendo 64. There are four different varieties of Dry Bones in Paper Mario: The Thousand-Year Door during the invasion of the X-Nauts. The first type appears in Hooktail Castle. This variety is named Dull Bones and is the weakest in the game. This type of Dry Bones cannot come back to life once its HP is taken, but it is able to build more allies. Many dead Koopa Troopas appear all around Hooktail's Castle, many of which are previous residents of Petalburg. Some of these are animate Dull Bones and others, like Kolorado's Father, are truly dead. Also in the castle is a different variety of Dry Bones, appropriately named Red Bones. This alteration is slightly more powerful than the Dull Bones and has blue eyes and a red tint to its entire body. In the first battle, Red Bones is accompanied by four Dull Bones. This variety can also create reinforcements of more Dull Bones and can revive itself if fallen, unlike its weaker counterparts. Red Bones is first encountered by Mario and his party in Hooktail's Castle, and it later reappears in the Palace of Shadow. In the first confrontation, Red Bones calls upon countless numbers of Dull Bones and they swarm in on Mario and his partner. The player has to use Mario's hammer to scatter the Dull Bones and engage the Red Bones in a battle, or get tossed out of the castle. Much later in the game, normal Dry Bones uncommonly appear in the Palace of Shadows and the Pit of 100 Trials. The normal variation is able to get back up once defeated, and is also able to build more allies at any point in a battle. To damage Mario and his partner, Dry Bones can throw bones at the pair. The normal Dry Bones is much stronger than both Dull Bones and Red Bones. They again collapse if beaten and get revitalized when the battle isn't finished quick enough. Fire attacks (such as Fire Drive, Fire Flower and Fiery Jinx) instantly defeat them, just like in the original Paper Mario. The palace is also home to Dark Bones. This variety is to Dry Bones as Red Bones is to Dull Bones; Dark Bones, much like Red Bones, are stronger than and able to build their weaker counterparts. Dark Bones are fought twice in the palace. The first encounter is when the Dark Bones call in innumerable amounts of Dry Bones, much like Red Bones do in Hooktail's Castle. The player once again has to use his hammer to clear away the minions and get to the leader of the troop, initiating a fight. If the player does nothing while Dry Bones are crowding around them, they get a Game Over. All of the types of Dry Bones are encountered once more during Mario's travels. They are encountered all at once in one room of the Palace of Shadows. The four types have to be defeated in the order of weakest to strongest: Dull Bones, Red Bones, Dry Bones, and finally Dark Bones. Doing so gives Mario a key to another part of the palace. Dull Bones also occasionally appear in the Audience. Dull Bones are the only audience members that do not give out Star Power upon successful Action Commands and Stylish Moves; they do, however, give out Star Power for Appealing. Dry Bones are once again featured in Super Paper Mario. Because the game is a platformer RPG game, the Dry Bones cannot be battled. Instead, when stomped, the Dry Bones collapse and revive after a little while. Unlike in previous Paper Mario games, it attacks by running into Mario and company. Dry Bones are found in The Underwhere and the Flipside Pit of 100 Trials in this game. In this game, the only way to defeat them is using Cudge to hammer them down, using Boomer to blow them to pieces, or using Bowser's fire. A new subspecies – the Dark Dull Bones – appear in the Flopside Pit of 100 Trials, where all the enemies are dark counterparts of the regular ones. This subspecies is stronger than its colored cousin, like all Dark enemies are. Mario is about to jump on a Dry Bones in an early screenshot. Dry Bones appear in Paper Mario: Sticker Star, but their appearance is closer to their main series' appearance, unlike the Dry Bones of previous Paper Mario games, whose appearance was based on the species' artwork for Super Mario World. However, like in the previous Paper Mario games, they lack arms, simply having floating hands. They are found in World 2. Dry Bones also appear during the boss fight against Petey Piranha in Rumble Volcano, where Petey Piranha can spit them out to battle Mario, this is the only time that the player can permanently destroy a Dry Bones. A Dry Bones can either attack by throwing a bone or by folding itself into a bone and tossing itself at Mario. If Mario defeats a Dry Bones in battle, it turns into a pile of bones in the overworld, but revives itself shortly after. Defeating a Dry Bones occasionally gives Mario a Bone sticker. Dry Bones return in Paper Mario: Color Splash keeping their appearance and behavior from the previous game. They can be eliminated permanently if certain walls are knocked down onto them. When defeated in battle, their bones fall and turn into a pile, and the Dry Bones revive some seconds later. They appear in Marmalade Valley and Redpepper Crater, as well as the parallel worlds of Vortex Island, Lighthouse Island and Fortune Island. Dry Bones reappear once again in Mario & Luigi: Superstar Saga in the Beanbean Kingdom when Princess Peach's/Birdo's voice is stolen. The Dry Bones in this game look somewhat different from other versions, as they have no shell. They walk on four legs , similar to the ones in Super Mario Bros. 3. They are found all along Hoohoo Mountain as the Mario Bros. try to scale the peak. Dry Bones attack by launching their heads at their opponents. If a Dry Bones' head spins vertically, it attacks Mario; if its head spins diagonally, then Luigi is the victim. To counterattack the Dry Bones while the creature is attacking, the Mario Bros. have to jump onto the spinning bone head as it flies towards either one. When they are defeated, Mario and Luigi occasionally receive a Mushroom. A stronger variety with a shell can be found in Teehee Valley. In the remake, Mario & Luigi: Superstar Saga + Bowser's Minions, this stronger variety of Dry Bones was given its own name, Elite Dry Bones, to distinguish it from its weaker counterpart. The original quadrupedal design for Dry Bones is retained for the main story mode, but Minion Quest: The Search for Bowser uses the Dry Bones' modern design, suggesting that the two types of Dry Bones differ by region. In that mode, they appear as enemies and allies that can be recruited. They are ranged troopers, and attack enemies by throwing bones at them. Dry Bones are strong against Koopa Troopas. Dry Bones appears as an enemy in Mario & Luigi: Partners in Time. Dry Bones reside in Yoob's Belly. When a battle is initiated, a Dry Bones throws bones at Mario and Luigi. Usually, the Dry Bones stays still while throwing the bone, which causes the bone to go towards a single brother. A Mario brother must jump to dodge this attack. 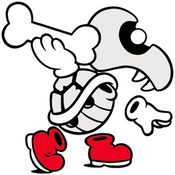 If the Dry Bones jumps before throwing a bone, however, the bone bounces over the brothers' head and causes damage if one of the Bros. jumps into the bone. Furthermore, Dry Bones is able to attack the Bros. one after the other. If the Dry Bones clacks, it attacks Mario before attacking Luigi, and if the Dry Bones twirls its head, it attacks Luigi before attacking Mario. Later in the game, large Dry Bones statues appear in Gritzy Desert. When these are encountered, the player has to split the babies and the adults. After doing this, they have to hit four blocks within ten seconds of each other. There are two pairs of blocks in the desert, and once the two pairs are hit, a hidden door to the Koopaseum opens. In the game, Mario & Luigi: Bowser's Inside Story, some Dry Bones are seen in the Fawful Theater. One is in the lobby of the building, and the rest attend Fawful's show. There are also two Dry Bones standing in the watchtowers of Bowser's mechanized castle during Bowser's fight against it. Dry Bones return in Mario & Luigi: Bowser's Inside Story + Bowser Jr.'s Journey, where they additionally are found as enemies and recruitable allies in the Bowser Jr.'s Journey mode. In Mario & Luigi: Dream Team, Dry Bones appear as part of Kamek's second battle. They simply walk into Mario or throw bones at him, but, if jumped on, they can fall apart and Mario can aim and kick their segments at Kamek. Regular Dry Bones appear in Mario & Luigi: Paper Jam during the Dry Bowser boss fight when he uses his inhaling attack, although their paper versions make a more common appearance as individual enemies. Papercraft Dry Bones also appear as enemies in the Papercraft King Boo boss fight. Mario Superstar Baseball is Dry Bones' spin-off debut. Dry Bones is introduced as a technique character as a part of Bowser's team. His four colors are white (by default), red, green, and blue. His strongest point is batting. He is a slightly below average runner and pitcher and below average fielder. This is one of Dry Bones' only appearances as playable from the start. Dry Bones have good chemistry with Koopa Troopa and Bowser. This game also introduces Dry Bones' current design, with him more resembling an actual Koopa Troopa. Dry Bones also appear in the sequel Mario Super Sluggers. Dry Bones is a powerful hitter in this game despite being an average batter in Mario Superstar Baseball. Like in Super Mario Galaxy, the Dry Bones in this game have two voice sets: one similar to the previous title's, and an older Boo-like voice from Super Mario 64. Each Dry Bones has good chemistry with a Koopa Troopa and Bowser. Oddly, its chemistry with Boo is neutral, despite having some similarities with that species, and that they are partners in Mario Party 7 and Mario Party 8. Dry Bones is the only team player with alternate colors who pitches with its left hand. Oddly, Dry Bones is a better batter and pitcher than Koopa Troopa in this game. Their fielding stat is the same, although Dry Bones is slightly slower than Koopa Troopa. Dry Bones later appear when Bowser steals the Vibe Scepter and kidnaps the Toads along with Mario and Luigi in the game Super Princess Peach. They only appear in Shriek Mansion and Bowser's Villa. These Dry Bones look similar to the models used in future games. They are able to throw bones at Princess Peach, and the bones can be blocked by a swipe from Perry. If a Dry Bones itself is hit or jumped on, it crumbles and revives itself in about three seconds, which is relatively fast compared to previous games. Dry Bones can be defeated permanently when Peach attacks them with her Rage vibe. This weakness is a throwback to Paper Mario, in which Dry Bones are weak to fire. There is also a subspecies that is introduced in the game. This variation is called the Sad Dry Bones, and it weeps openly whenever it is seen. It is also able to throw bones at the Princess, except that these bones are much faster and more difficult to avoid. The first game of the Mario Party series Dry Bones appears in is Mario Party 7 as an unlockable, playable character. It can be purchased in the Duty-Free Shop for a price of 1000 Cruise Mileage Points. The Magic Orb is Dry Bones' special Orb, which doubles the number on the dice block and then turns Dry Bones invisible. In artwork of the game, Dry Bones is usually partnered with Boo. Dry Bones reappears in the next game in the series, Mario Party 8, once again as a playable character. This time, it is available from the start of the game. Its partner is Boo. Dry Bones' biggest appearance in the Mario Party series is in Mario Party DS where it appears as a non-playable boss character. In the story mode, it takes over the board DK's Stone Statue and turns Donkey Kong into stone. Diddy Kong asks Mario & co. to rescue Donkey Kong and then the Party begins. On the board, Dry Bones can be found sleeping in a coffin. If the player stops on a Green Space nearby its coffin, Dry Bones wakes up and lifts the coffin lid slightly. It then shuts the lid with such an amount of force that the player is sent back to the start or right next to the Star. When the player completes the board in story mode, a boss fight with Dry Bones begins in the minigame Hexoskeleton. Dry Bones attempts to destroy the characters by crushing them underfoot and the characters must Ground Pound switches on the battle field to attack it with lightning. It is also possible to acquire a trophy of a defeated Dry Bones by beating the Hexoskeleton minigame five times. 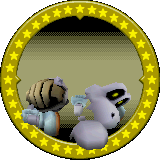 In Mario Party 9, Dry Bones is not a playable character; instead, it is the mini-boss of Boo's Horror Castle. He is summoned by Bowser to work with King Boo in destroying Mario and his friends. The boss minigame it is faced in is called Deck Dry Bones. In the game, Dry Bones leaps from platform to platform, and the players damage it by picking cards with the same pattern as the platform it is standing on. Dry Bones cards also appear; selecting these allow Dry Bones to attack the player that does so. Three Dry Bones also appear in the minigame Ruins Rumble. Despite being non-playable characters, they and the player's opponents must be defeated in order to win the minigame. They also have an appearance in the minigame Smash Compactor, in which they raise the compactor after each round. Throughout the minigame, when the compactor raises, a Dry Bones may also appear on top of the compactor. Dry Bones also appear Mario Party: Island Tour as non-playable characters. Dry Bones also appears in the minigame Tap Dash, and as a judge in minigame The Choicest Voice. In Mario Party 10, a Dry Bones is once again a non-playable character, and can be seen on the Bowser amiibo Party board, where it is purely for decoration. Dry Bones appears in Mario Party: Star Rush known as Mega Dry Bones as a boss. In his minigame, Mega Dry Bones's Femur Fever, players need to Ground Pound the platform they're standing on to launch a cannonball at him. Each ground pound lights up one light out of three. If all three are filled, a cannonball is launched. If the Ground Pound is done at the peak of their jump, then two lights are lit up instead of just one. The more allies on a player's team, the faster they can launch cannonballs. Mega Dry Bones can also attack by throwing a bone that goes through each players' platforms in a straight line starting at either Player 4 or at Player 1. When Mega Dry Bones' health bar goes past the halfway mark, the bones he throws are now on fire and he attacks more frequently. Dry Bones returns as an unlockable playable character in Super Mario Party, for the first time since Mario Party 8. Unlike the other unlockable characters, there is no exact criteria for unlocking Dry Bones, as he is unlocked randomly after playing different modes. Dry Bones' Dice Block has three 1's and three 6's on it. The first appearance of a Dry Bones in the Mario Kart series is in Mario Kart DS. It is an unlockable playable character, unlocked by winning every Nitro cup (i.e. the Mushroom Cup, Flower Cup, Star Cup, and Special Cup) in the 50cc Grand Prix. Its personal karts are the Standard DB, the Banisher, and the Dry Bomber. These karts have the best handling and acceleration stats in the game, but are middling in weight and speed. Dry Bones can also use any other kart in the game when certain criteria are met. Dry Bones is the staff data used on Donut Plains 1 and has a time of 1:08:027 in the Dry Bomber. It is also the staff data on Banshee Boardwalk and has a time of 2:14:403 in the Dry Bomber. Its weight class in this game is light, like with Peach, Yoshi, Toad, and Shy Guy, though is lighter than all of them. Dry Bones reappears in Mario Kart Wii. It is an unlockable character and is unlocked by winning the 100cc Leaf Cup. Dry Bones is a lightweight character (like the babies, Toad, Toadette, Koopa Troopa, and lightweight Miis), which means it has a low top speed, but good acceleration and off road ability. Each of its karts are recolored in gray and black. Dry Bones gets a small acceleration and drift bonus, but its best bonus is its mini-turbo, which is rivaled from that of Koopa Troopa, Wario, and Dry Bowser. This enables vehicles like the Mini Beast and Bullet Bike to perform slightly stronger mini-turbos after a drift. Though Dry Bones doesn't appear as a playable character in Mario Kart 8, the species still appears in the game on various courses, including the cavern of Bone-Dry Dunes; here, they serve as hazards, and fall apart when driven into. An image of a Dry Bones can be seen on a fabric hanging from the walls of the cave. Several Dry Bones can also seen spectating in Bowser's Castle and 3DS Neo Bowser City. There is also a stamp of a Dry Bones that one can unlock by beating the staff ghost in Bone-Dry Dunes. After appearing in a non-playable role in Mario Kart 8, Dry Bones appears as a playable character in Mario Kart 8 Deluxe, a port of Mario Kart 8 for the Nintendo Switch. He is in the same lightweight subset as Baby Mario, Baby Luigi, and small Miis. His kart symbol is a sideways shot of his skull. He is also the 200cc staff ghost for Bone-Dry Dunes. Dry Bones makes its appearance in Mario Strikers Charged as a sidekick. Classified as a defensive player, Dry Bones' highlights are its speed and defense, meaning it can react quickly and run fast towards the ball, while its defense is Tackling opponents fiercely to knock them off in a short time. However, like the defensive captains, Dry Bones also shows a bad passing skill and power as to kick the metallic ball immediately on its maximum power. Its Skillshot is the Shocker. After charging the ball completely, Dry Bones electrifies the ball, making the rival's Goalkeeper or even another competitor unable to move and react briefly for another shot. When evading a potential opponent attack while having the ball, Dry Bones can turn around and disappear, making it almost invincible, capable of passing hazardous obstacles, such as power-ups dropped on the field or dodging the Goalkeeper's moves. However, Dry Bones cannot use its deking capabilities to pass through the electric fence; it is electrocuted, which results in losing control of the ball. The durability and effect of Dry Bones' deke depends the light the ball is emitting. Therefore, if the light is white, Dry Bones can go further while invisible. Once Dry Bones has performed its evasion in this way, the light of the ball changes back to its lowest power. Dry Bones's first appearance in the Mario & Sonic series was Mario & Sonic at the Olympic Games as Wii-exclusive referees. In the follow-up, Mario & Sonic at the Olympic Winter Games, they appear as rivals. On the Wii, three of them appear along with Dry Bowser as the final rivals in Festival Mode in the event Ice Hockey on the last day. Dry Bowser is the goalie and there are three Dry Bones as the field players. Also in the Wii (Team Festival Mode) and in the DS Version, they appear without Dry Bowser in the event Curling with four Dry Bones instead of three. Dry Bones also appears in Mario & Sonic at the London 2012 Olympic Games. It is the rival of Table Tennis in London Party Mode, and later, Dream Hurdles. When the player defeats it, they'll win a sticker. It's also one of the characters that can be spoken to. In the 3DS version's story mode, Dry Bones appears alongside Dry Bowser when Toad and Omochao are separated from Mario and Luigi. The two are fearful of them at first, but attempt to stand up to them when Mario and Luigi arrive. Dry Bowser and Dry Bones challenge them to an Olympic event, but the Marios defeat them. The two then escape as Toad and Omochao commend Mario and Luigi for their victory. Dry Bones also appears in the Wild Ones Bonus Story, along with Magikoopa, Goomba, Boo, and Dry Bones as Bowser's five minions that he brought with him. Dry Bones makes his first playable appearance in the Mario & Sonic series in Mario & Sonic at the Rio 2016 Olympic Games. He appears exclusively in the Nintendo 3DS version, where he is only playable in the BMX event. Dry Bones appears in Super Smash Bros. Brawl and Super Smash Bros. for Nintendo 3DS as a trophy. According to a datamine of the former game, Dry Bones would have appeared as an enemy in the Subspace Emissary. Dry Bones appear in Mario Sports Mix, in Ghoulish Galleon. They are sometimes hidden in boxes, and stun players if they come in contact with it. They can also be used as a shield by players. In Mario Golf: World Tour, one of the names that can appear on the tournament scoreboard is that of Dry Bones. Dry Bones' appear as enemies in Puzzle & Dragons: Super Mario Bros. Edition. While they mostly appear in tower and castle courses, they can also appear in the underground, ghost house, and volcanic courses. Dry Bones's main attribute is Fire, while its sub-attribute is Dark. An an enemy, a Dry Bones normally attacks every two turns, and it has the ability to blind the player to make it harder to see the Orbs that are present on the touch screen. As an ally, the Dry Bones's skill can change all Water and Wood Orbs into Fire Orbs, while its Awoken Skill boosts the HP stat for all team members by a small amount. The player can acquire a Dry Bones by transforming a Red Koopa Paratroopa using six Boo Mushrooms. A mash-up that uses the Dry Bones is also present, known as Dry Bones & Cheep Cheep. Their main attribute is Water, while their sub-attribute is Fire. As an enemy, Dry Bones & Cheep Cheep are able to deliver first strike blows, and they can even perform Frenzied Blows to deliver more damage than normal to the player. As an ally, Dry Bones & Cheep Cheep can change all Orbs into Fire, Water, and Heart Orbs, while their Awoken Skill boosts the HP stat for all team members by a small amount. The player can acquire a Dry Bones & Cheep Cheep by transforming a Red Koopa Troopa & Cheep Cheep with six Boo Mushrooms. In Skylanders: SuperChargers, Dry Bones acts as an assistant to Hammer Slam Bowser. The player must have the Molten Bones soul gem upgrade. When he activates his Molten Monster form, he can attack one of his Koopa Troopas and turn them into Dry Bones. They tend to do more damage and have more health than regular Koopas. Dry Bones also appears as a vehicle mod for Bowser's Clown Cruiser titled Dry Bone Basher and Steeled Bone. In Mario Tennis Aces, Mario faces Dry Bones during the "A Bone to Pick" challenge on the Bask Ruins court. He serves as the guardian of the Temple of Bask, not allowing visitors to enter the temple unless they can prove their tennis skills. Dry Bones also appears in the game's training mode, where he teaches the player all of the basic shots made in a tennis match. According to the game's training mode, Dry Bones is classified as a Tricky type from his emblem in Marina Stadium. Dry Bones is set to be added as a playable character through the May 2019 online tournament. A Dry Bones can be built out of LEGO bricks in a certain area in Lego City Undercover. Unlike most other Mario cameos, the Nintendo Switch port does not retain this cameo. In Minecraft, there is a Super Mario Mash-Up Pack where Skeletons are reskinned as Dry Bones and Wither Skeletons as Dark Bones. In addition, Strays are reskinned as Dry Bones' blue color scheme as seen in the Mario Baseball games. Dry Bones also appears as a playable skin, though it is smaller than the non-playable Dry Bones and its variants. 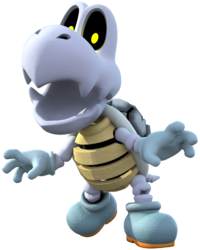 Dry Bones are undead Koopa Troopas with gray skin, dark gray shells, black eyes, yellow pupils, and pale blue shoes and gloves. 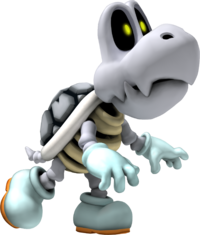 A Dry Bones' shell is similarly designed to that of a Koopa Troopa's, but it is the aforementioned gray, and features black patterns in between each shell segment. Dry Bones never maintains a consistent appearance, due to receiving changes between games and media, which range from minor changes such as increased or decreased vibrancy in colors, to major alterations such as having longer or shorter limbs, and appearing as a bipedal or quadrupedal creature. 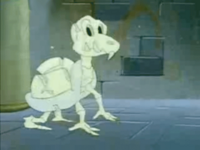 In Super Mario Bros. 3 and the DIC Entertainment Mario cartoons, Dry Bones appears as a quadruped, due to standing on all fours, and never standing upright. The DIC Mario cartoons give Dry Bones hollow eyes, shorter limbs, and longer necks. Additionally, the Super Mario Bros. style in Super Mario Maker uses a heavily modified Koopa Troopa sprite, with the lone differences being gray skin, black eyes, and blue pupils. Super Mario World is the first game to give Dry Bones an upright stance, which would be used in a multitude of subsequent installments. However, Dry Bones' Super Mario World design comes with exclusive elements not present in other games, such as white pupils, a small set of teeth, and physically larger stature than the Koopa Troopas. Later games resize Dry Bones so they are the same height and shape as a Koopa Troopa. Mario & Luigi: Superstar Saga once again depicts Dry Bones as a quadrupedal species; in Mario & Luigi: Superstar Saga + Bowser's Minions, the Dry Bones in Beanbean Kingdom retain their quadrupedal stature, though their Mushroom Kingdom relatives present in the Minion's Quest: The Search For Bowser side story are shown in an upright posture, thus suggesting that Dry Bones differ depending on the region. Both Super Mario Galaxy games depict Dry Bones as bipedal creatures who stand and move in hunched postures, a feature that is reused in Super Mario 3D Land and for Parabones in Super Mario 3D World and Super Mario Odyssey. In the Super Smash Bros. series, Dry Bones' trophy has a more realistic appearance than its species' main depiction. In Super Smash Bros. Brawl, Dry Bones' trophy has a more monotone appearance, as well as a darker color scheme and a detailed shell. In Super Smash Bros. for Nintendo 3DS / Wii U, its trophy has a more vibrant and cartoonish appearance, as well as much less detailing. In the first three Paper Mario games, Dry Bones use their Super Mario World design, but with three tufts of hair, a feature that is only present in their Super Mario World artwork. Starting from Paper Mario: Sticker Star, Dry Bones use their design from the New Super Mario Bros. series. Additionally, Paper Mario: Color Splash gives Dry Bones a pronounced paper outline. Like other enemies, in the NES and SNES Mario games, Dry Bones didn't have any voice acting or in-game text, both due to technical limitations and Nintendo's habit of having silent characters. Super Mario RPG: Legend of the Seven Stars is the notable exception, which gives them a Psychopath quote. Starting from the early 2000s, Dry Bones received voice acting, though it comprised of clustered bone "grunts" and "yells" provided by Nintendo sound manager and composer Toru Asakawa, who also does King Boo's voice. In contemporary games, Dry Bones receives in-game text so players can understand what they're saying, while some games uses "rattle" and "clickety-clack" sounds as speech with the translation in parentheses. Super Mario Party notably has Dry Bones' speech translated; however, unlike other games which do this, Dry Bones pauses some of its sentences with "..."s. As an earlier instance, Paper Mario: The Thousand-Year Door had Dark Bones pause its sentences; however, Dark Bones spoke intelligibly, as opposed to having its speech translated in parenthesis. Due to being undead, skeletal Koopa Troopas, Dry Bones are naturally immune to lava and all forms of fire. However, this trait is somewhat inconsistent. In the New Super Mario Bros. games, Dry Bones is unharmed by lava, but if his head is submerged in lava, it takes longer for Dry Bones to reassemble himself; in New Super Mario Bros. U, Dry Bones is completely immune to lava. In the Mario RPGs, Dry Bones take extra or fatal damage from fire or explosions. Dry Bones can't be defeated permanently, since it will always reattach its head to its body in a matter of seconds. This results in Dry Bones' defensive qualities in most Mario sports games, due to its small size and excellent survivability, while sacrificing a lot of power and offense. In the Mario & Luigi games, defense is Dry Bones' best stat, though Super Mario RPG: Legend Of The Seven Stars and the Paper Mario games take this trait further, with the former game giving Dry Bones infinite health, and the latter games having them respawn a few minutes after a battle. Sometimes, Dry Bones is also portrayed as a technique character. Dry Bones generally attack their foes by throwing bones at them, a trait that first appeared in Super Mario World. Mario Strikers Charged gives Dry Bones bizarre abilities such as teleportation and electrokinesis, which are used in his deke and Skill Shot respectively. Puzzles and Dragons: Super Mario Bros. Edition gives Dry Bones associations with fire and darkness. Deke: Teleports to another area. They must have a bone to pick with Mario. No matter how many times he stomps them, these guys put themselves back together again. Can't they just rest in pieces? By the way, have you noticed how nimble they are in Mario Kart? Skeletons must be really aerodynamic or something... How these guys are alive when they're just bones is anyone's guess. Jump on one to make him fall apart, but don't expect it to rest in pieces! It'll be back on its feet in no time. These oddly cute little guys also turn up in the Mario Kart series as lightweight racers. Probably because they don't have any skin or muscles weighing them down. For this subject's image gallery, see Gallery:Dry Bones. Karon Derived from 「からから」 karakara, meaning "dried-up", or alternately, the sound of clattering. Charon has the same pronunciation, but "Karon" is the official romanization. Skelett-Koopa "Dry as a Bone"
Since New Super Mario Bros., if the player manages to stomp on the Dry Bones, and the head falls into a pit or lava, it still comes back out and join the rest of the body, although it takes longer for it to do so. Dry Bones get their name from the Biblical verses of Ezekiel 37:1-10, in which a pile of dry bones comes back to life while making an odd sound.